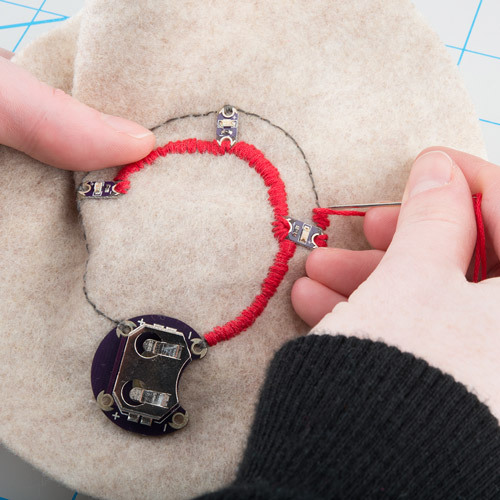 Conductive thread acts like uninsulated wire, which makes it great for sewing components together, but once a project is finished, the movement of fabric can let some pieces of thread accidentally touch. When working with conductive thread, make sure to pay special attention to insulating any power and ground lines so that they don’t short out your battery. Insulating stitches, once a project is complete, adds protection from potential short circuits created by movement, folding, or contact with conductive surfaces, as well as adding an extra barrier during wear and tear or washing. Make sure your project is fully functioning and completed before doing any insulation techniques – most of these are permanent methods of covering your stitching, and it will be very difficult to do any adjusting after the paint/glue dries. 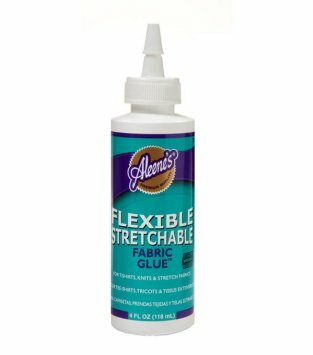 Aleene’s Flexible Stretchable Fabric Glue is a common brand name and one we use a lot here in our e-textiles projects. Check out Mika Satomi and Hannah Perner-Wilson’s Language Game project for a costume that uses this technique over conductive fabric traces. 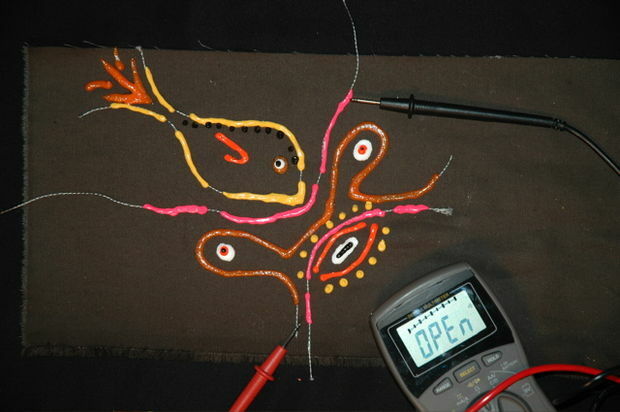 Learn more about using conductive fabric instead of thread in your project here. Fabric paint is a quick way to add insulation and style to a project. Using different colored paints to hide and decorate stitches can create a really unique look for the front of your project. We recommend using 3D or ‘Puff Paint’ because its thickness makes covering traces a lot quicker and the tubes have a fine tip that makes applying much easier than a paintbrush. Using a layer of fabric (or building your circuit underneath a garment’s lining) is an easy way to protect conductive thread and leave a soft backing if the project is going to be worn against skin. This is also good method for insulating the front of your circuit with fabric designs. 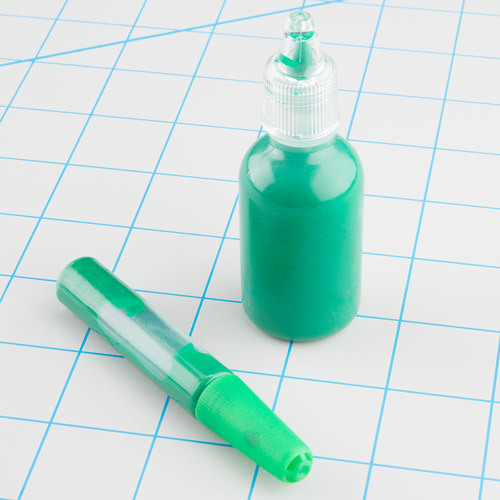 If using glue, be careful it doesn’t saturate through the top of the fabric. 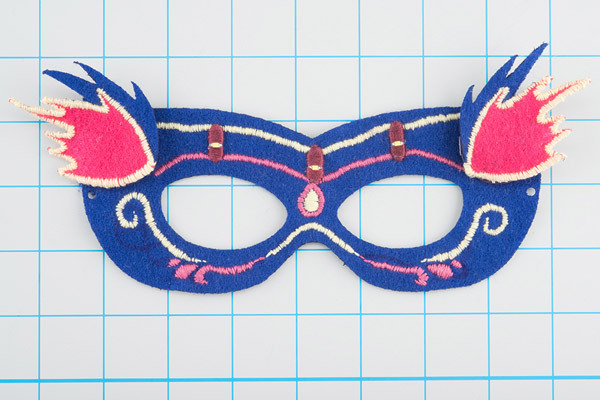 Carefully follow the line of conductive thread and cover using a satin stitch. Here’s a tutorial from Sublime Stitching on the satin stitch. 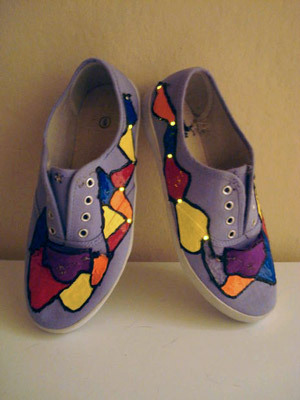 You can also add additional embroidery around the conductive thread to incorporate it into a larger design. Get creative! Fusible interfacing is typically used to add some structure or strength to parts of garments such as necklines or buttonholes. We’ll be using interfacing to cover conductive thread traces in wearables projects. 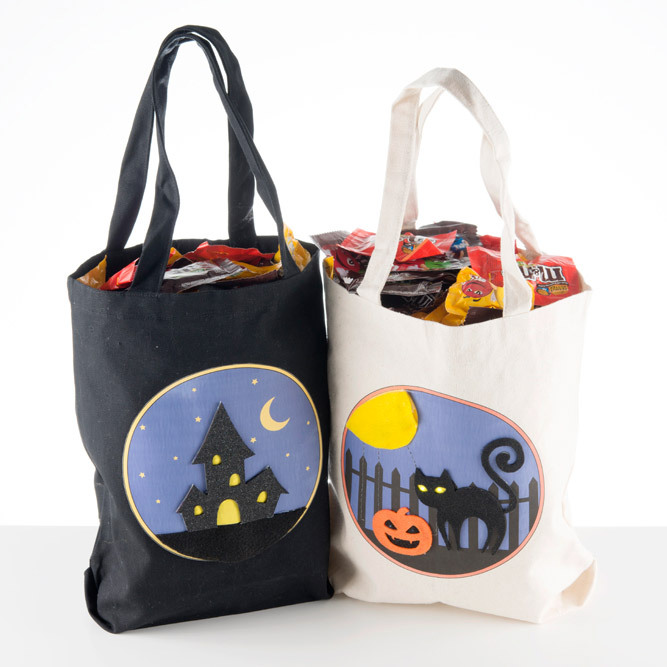 When you go to the store look for a fusible or iron-on web or interfacing - make sure that it is one-sided adhesive. Some stores sell a double sided iron-on product made for fusing two pieces of fabric together, we won’t need that. Some common brands are Heat'n Bond (sold in a package) and Pellon (sold on a bolt as cut by the yard). 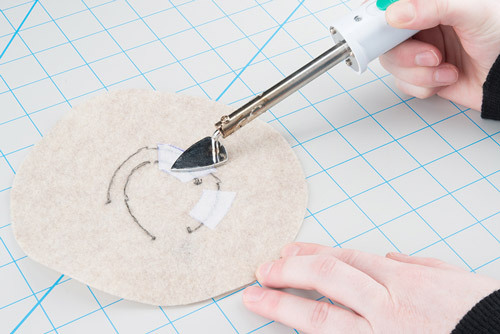 Draw on the interfacing to mark out small pieces to cover the conductive thread. Be careful to leave some room around any components so the interfacing doesn’t cover them. The heat from the iron could be damaging to LilyPad pieces. Use a piece of parchment paper between the project and your iron to protect from any adhesive accidentally transferring to the iron. 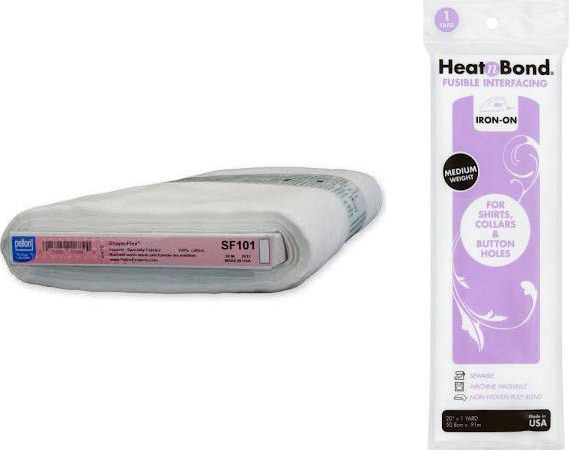 Some fabrics don’t respond well to heat and could melt when using the iron setting needed to activate the adhesive - always check your fabric or do a test on a scrap piece before ironing. 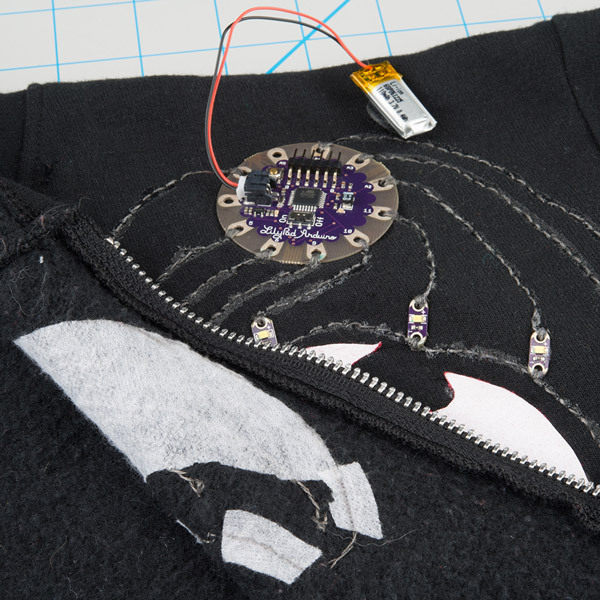 This LilyPad powered light up sweatshirt uses interfacing to protect the stitching and for the wearer’s comfort.